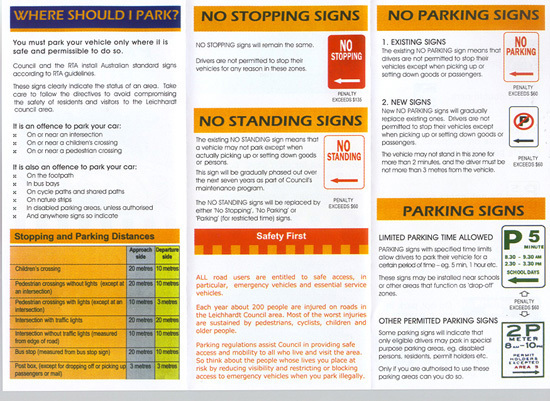 Leichhardt council gets tough on illegal parking ... for about a minute. And it's been "business as usual" ever since. All Rangers and Parking Officers are highly trained to spot an expired meter at a kilometre away. However, they face instant dismassal if they ever venture into residential areas and book a resident, ratepayer and most of all a voter. The policy is known as "Eyes Wired Shut", backed up by "Selective Avoidance" procedures. 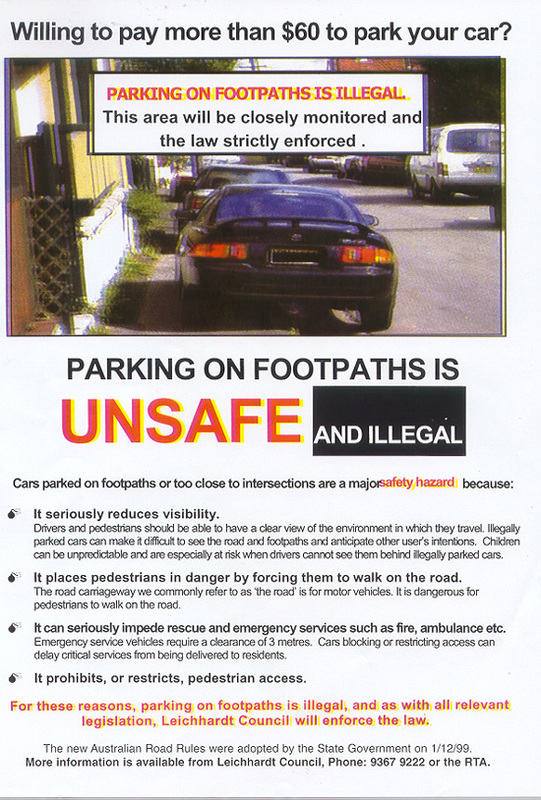 "PARKING ON FOOTPATHS IS ILLEGAL. THIS AREA WILL BE CLOSELY MONITORED AND THE LAW STRICTLY ENFORCED." The Municipality of Leichhardt is made up of very narrow streets and legal on-street parking is at critical levels. However, after years of correspondence, appearances before Council and general lobbying by the PCA, Leichhardt Council finally printed and distributed the above flyers. In doing so they acknowldged that the needs and rights of the pedestrian and the enormous safety, amenity, access and health benefits to the community, far outweigh the "wants" of motorists to park anywhere and everywhere. 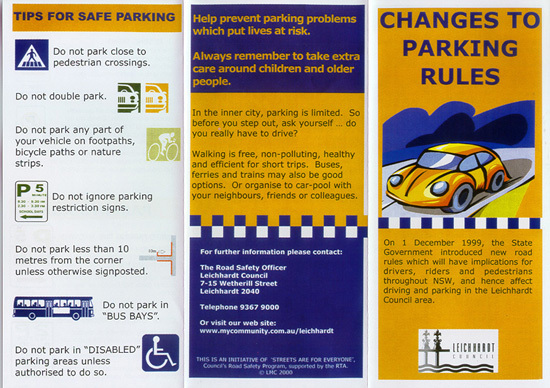 Unfortunately, these flyers were simply a device used to pretend that Leichhardt Council was actually going to enforce the Parking Laws. To this very day, aboslutely nothing has changed and resident motorists are "permitted" through a covert policy of non-enforcement, to openly flout the Australian Road Rules and park wherever and however they want.